South wall of the enclosure with the vertically raising panel doors in their closed position. Note the lowest panel door is 1" lower than the white arched wall. The arched walls have to be above the concrete floor so they can roll back with the main arch. 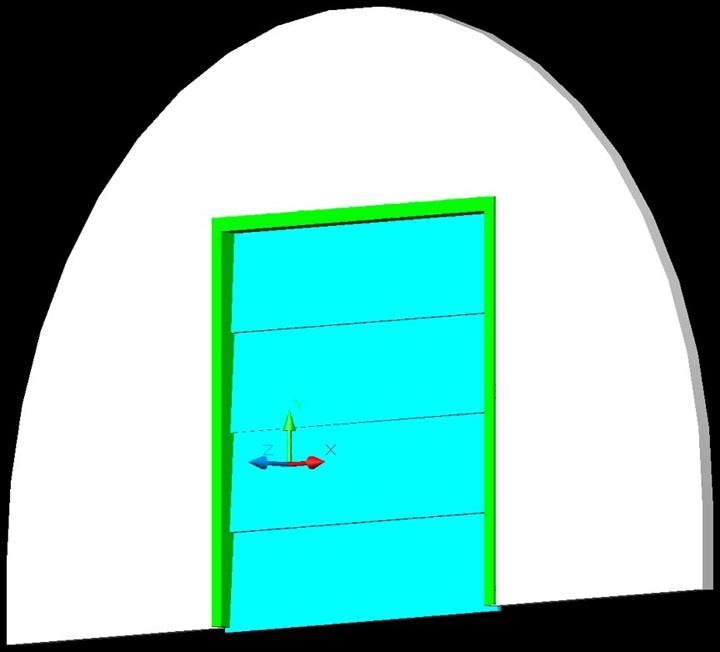 Left: 2-D wireframe image shows door in the down position. Note the location of the small blue squares at the top of the highest three door panels. Right: door panels shown in their raised positions. The small blue squares stop a lower panel from raising up further. The round circle toward the top of the door assembly is a drive bar. The gray box next to it is the motor housing/drive system.